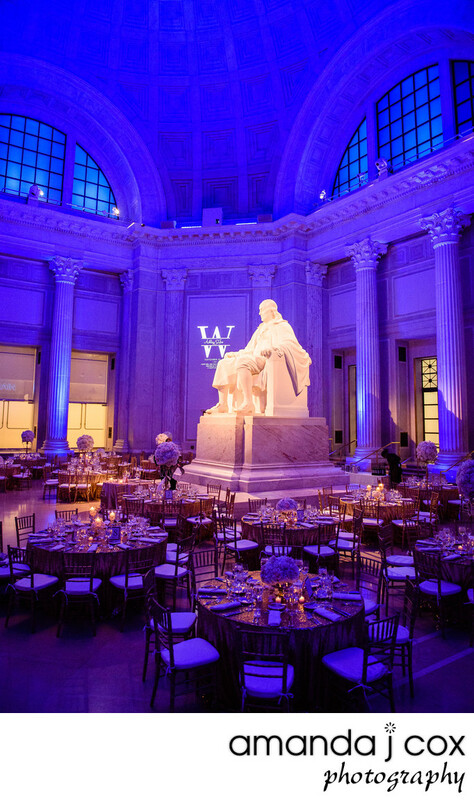 There is nothing more impressive than walking in to a wedding reception in the Franklin Institute rotunda and seeing impeccably decorated tables at the base of the National Benjamin Franklin Memorial Statue. The rotunda, modeled after the pantheon in Rome and complete with marble floors, columns, and dome would be any bride's dream location for their wedding reception. Not only will be guests be watching your first dance as a married couple, but Ben Franklin will gaze down from his 92 ton marble perch. The Franklin Institute has such stunning architecture and views that it is such a pleasure to photograph brides, their grooms, and the wedding party everywhere. Whether is is sneaking away from the wedding reception for a private moment on the rooftop terrace or walking up the main staircase with you bridesmaids and groomsmen, you could not pick a more perfect setting for your day. When we photographed this wedding for Ashley and Joe, they started the day at the ceremony at Old St. Joseph's Church in Old City Philadelphia. From there, the Philadelphia Trolley Company had taken us to a number of great venues with the entire bridal party including Rittenhouse Square for an amazing first look, LOVE Park, Dilworth Plaza at Philadelphia City Hall, and the Philadelphia Art Museum for bridal party photos before arriving at The Franklin Institute. It was a whirlwind day but the images will last a lifetime for the bride and groom. Location: 222 N 20th Street Philadelphia, PA 19103.